In addition to being the only begotten Son of God and the Friend and Redeemer of sinners, Jesus was the greatest teacher to ever walk planet earth. He drew many illustrations from nature teaching spiritual lessons from where the people lived. In John 15:5 He used the grape vine; there are many branches to produce the harvest and there are many people in Christ’s field of productivity, no one superstar or renegade isolationist! As the branch must draw its fruit producing life from the vine, so to produce His fruit we must abide in Him drawing our life from Him. 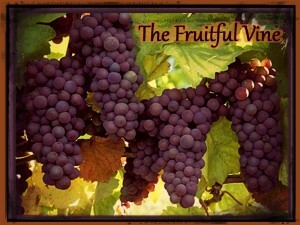 As each productive branch so nourished by the sap of the vine produces its part of the harvest, so God looks for much fruit. Bearing fruit is a natural process of abiding in the vine, the living branch neither sweats it nor struggles, it just bears fruit. And stay right close to My side. I help you always the right path to see. Strength you receive all the time. If only you trust Me and believe.